October 9, 2014 By This post may contain affiliate links. Aren’t those jack-o-lantern pop stands cool? They were designed for me by Janine of the Cake Pop Stand Co. Each wood stand has holes that are the perfect size for paper straws and are spaced far enough apart to display my rice krispie treat pops. Each stand even has a little bling along the edges. They are really sturdy and held up my set of lollipops with ease. 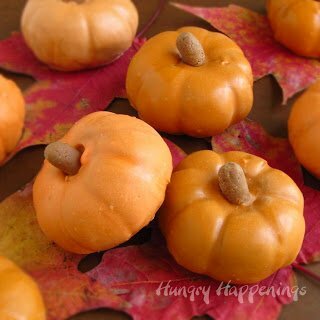 I am really excited to have these on my table this Halloween to showcase these Pumpkin Spice Jack-O-Lantern Treats. 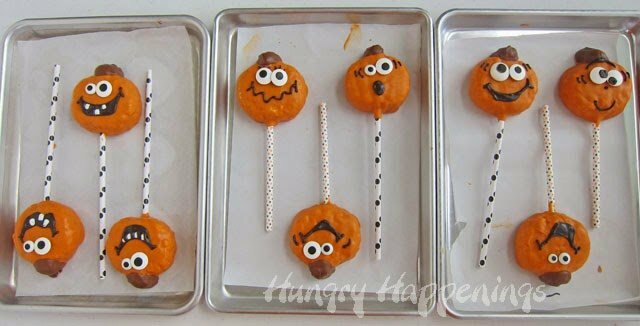 I’ll also be making some lollipops using a set of pumpkin embellished straws. She has a wonderful selection of paper straws. 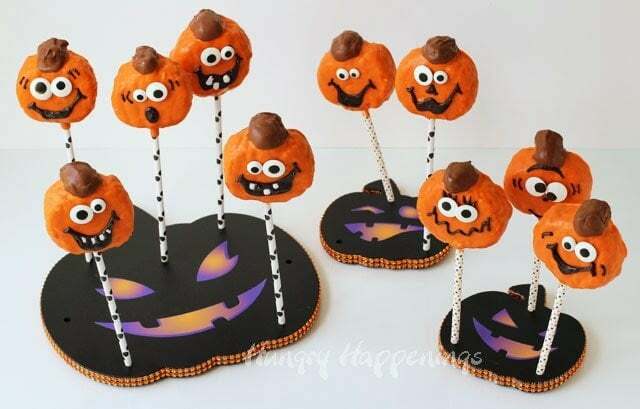 Janine has graciously agreed to give away a 4 Piece Set Halloween Cake Pop Stands along with some Spider Embellished Straws to one lucky reader. We realize not everyone can win, so she is offering a discount to anyone else who would like to make a purchase by October 31, 2014. Just use the coupon code HUNGRY10 at checkout. The giveaway instructions are at the end of this post, but wait, wait, wait. Don’t go anywhere. 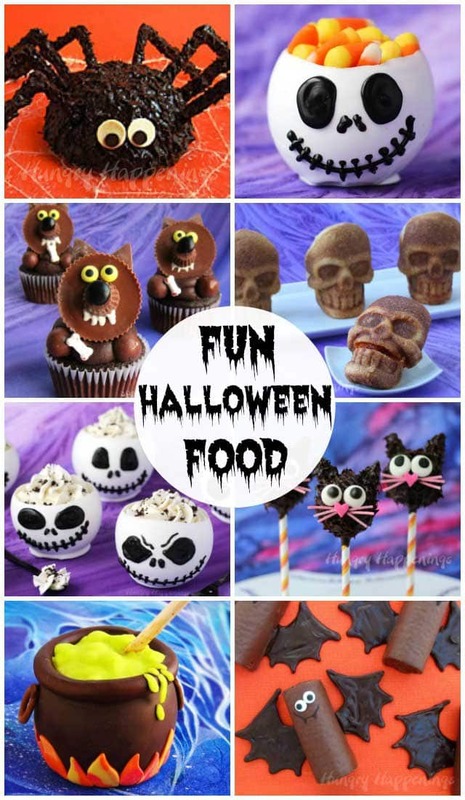 Don’t you want to see how and why I made these cute Halloween rice krispie treats? Every room in my house is now filled with all things pumpkin. Decorating this year for our party has certainly been different. We usually have parties with gory or scary themes. From our Dead Man’s Diner to our Carnival of the Creepy Crawlers and our Zombie party, our guest have come to expect to be freaked out at least a bit. This year, there will be no shrieking or shrinking, just big smiles. Big toothy grins. Just like on these silly jack-o-lanterns. 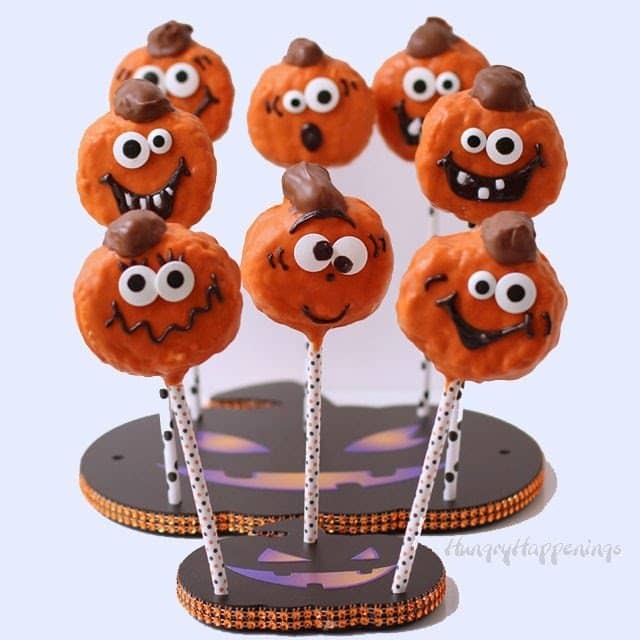 Each of these rice krispie treat pops has been dipped in Pumpkin Spice Candy Melts so they not only look like pumpkins but taste like them too. I couldn’t help but eat one, and I know my party guests are going to love them. 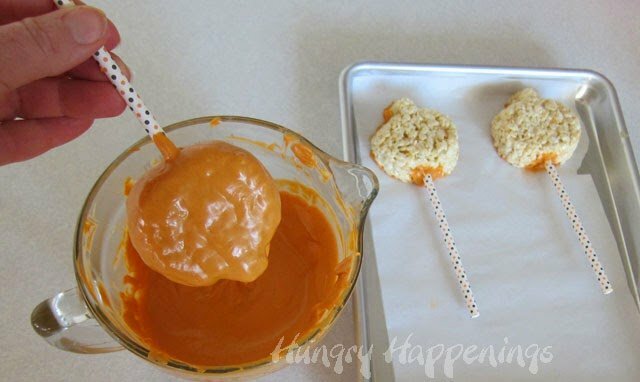 The candy coating has just the right amount of pumpkin spice flavor and it pairs so well with the rice krispie treats. I need to store these under lock and key so I don’t eat any more before the party. Before you begin, if you don’t have experience working with and melting Candy Melts, see my Chocolate Making Tips Page for instructions. 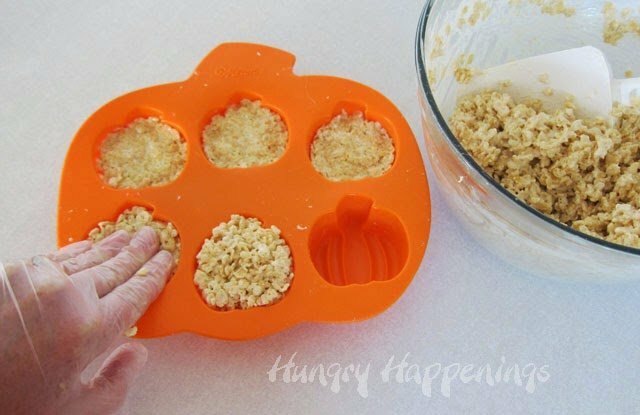 Grease silicone pumpkin mold with butter. 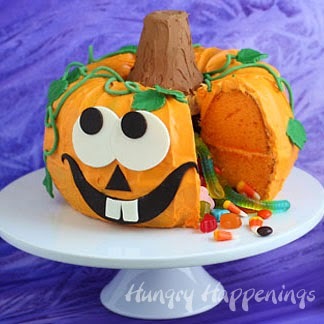 Fill the pumpkin cavity with cereal treat mixture. Press down on the cereal treats to compact them to make them more solid. Unmold the treats and let them sit at room temperature for 30 minutes. 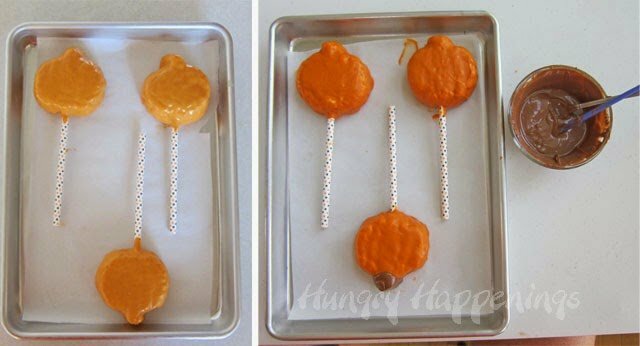 Melt the Pumpkin Spice Candy Melts. 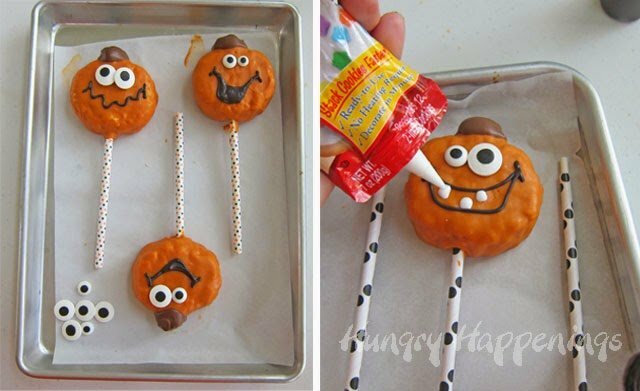 Brush a thin layer of the candy melts on the back side of each pumpkin. Set the candy coated side down on a parchment paper lined baking sheet. 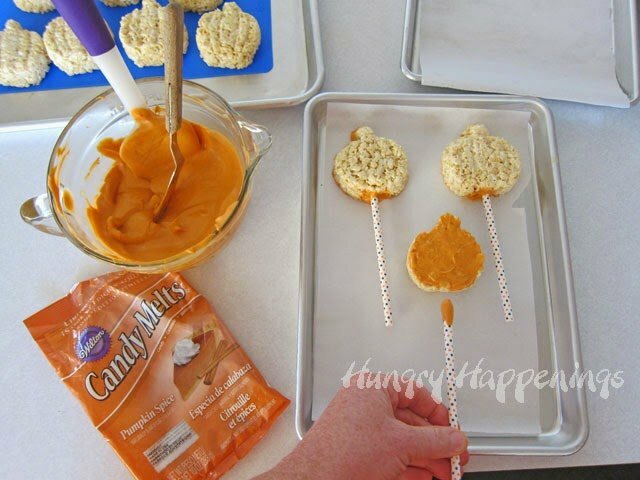 Dip the end of a lollipop stick or straw in the candy melts and insert one into each rice krispie treat pumpkin. Pop them in the freezer for 3-4 minutes. 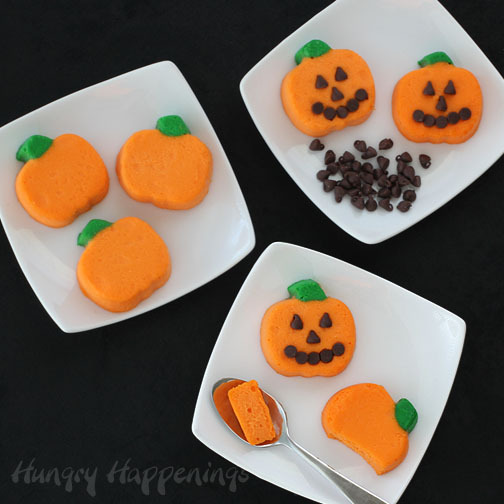 Dip the pumpkin treats in the pumpkin spice candy melts. Allow the excess to drip off. Set on a parchment paper lined baking sheet. Freeze for 6-8 minutes, until hardened. Melt light cocoa candy melts. Paint some on the stem of each pumpkin using a food use only paint brush or pastry brush. Melt the black dark cocoa candy melts. Spoon into a zip top bag. Use it to attach two candy eyes to each pumpkin, then pipe on a smile. If you want, you can add some white royal icing teeth. Allow the teeth to dry before piping the chocolate smile on around them. Pop the treats back in the freezer for a minute or two just until all the decorations are hardened. Store in an airtight container for up to a few weeks. oh my how fun! these stands are so cool 🙂 man what i wouldn't give to go to your pumpkin party! This is a great idea. 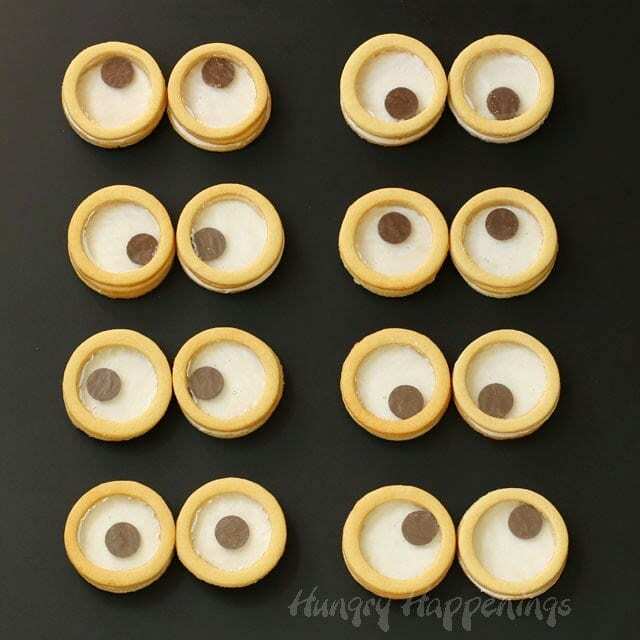 How did you do the faces on the cake stand itself. Does it come with it? Or did you print it out yourself, if so can you share where you got the color/shapes, Thanks? Genie, Janine added the faces to my stands. If you are interested in having anything special on your stands, I'm sure she'll be willing to work with you. She is very creative. I just told her we were having a pumpkin carving party and she came up with the design. I love them! I love all the content here, couldn't ask for anything more! Love these. I am always completely amazed at your creativity and awesomeness. I have been looking at a smaller mold like this for days now trying to think of something fun and unique to do with it and here you've amazed us all…again. Thanks for sharing. I like seeing your recipes for the holidays. you guys are awesome – keep up the good work! I really love your blog the way is right now, so I don't have much more to say that keep the hard work and good luck 😀 BTW, thanks for the giveaway!! I love your site & can't think anything you need to add or take away from it. Halloween is my favorite holiday; you couldn't post enough Halloween themed stuff! I especially love your step by step instructions. Love the holiday themed desserts! Your stuff is so cool. 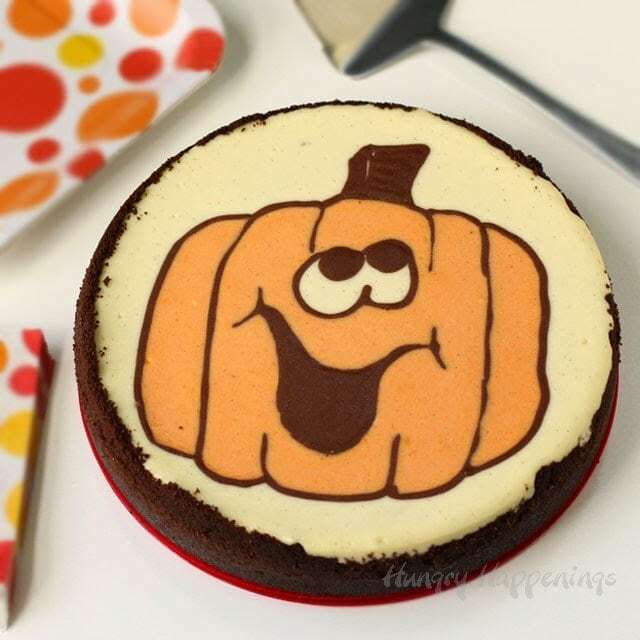 I'd love to see more cupcake decorating ideas. I love all the photos to go along with the detailed instructions – the more, the better! 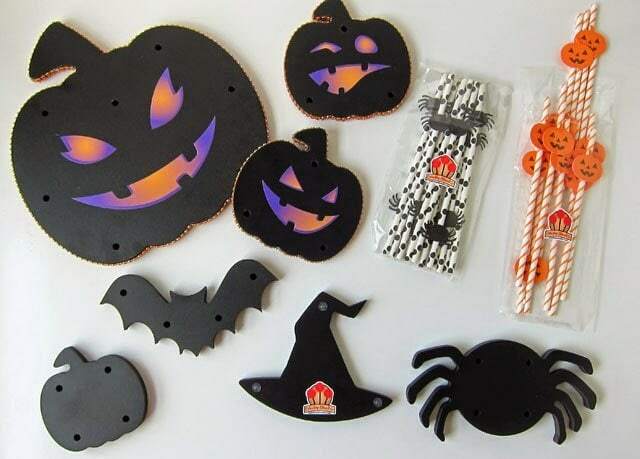 I sooooooo want to win this set of stands, they would be the perfect holder for all my Halloween Treats! And speaking of treats, your RKT pumpkins are the pick of the patch! 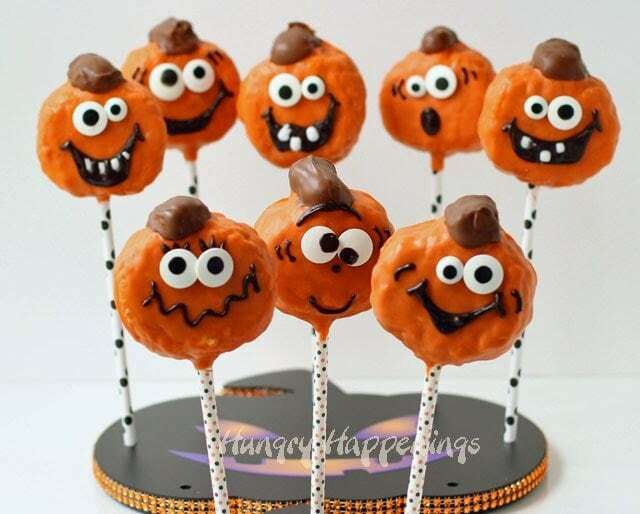 These pumpkin rice krispie guys are so adorable…love the squiggly mouthed cutie and all the rest. The blinged out pumpkin stands are pretty amazing too. I'm looking forward to your pumpkin themed party pics! These are just adorable. My kids will love them! Thanks for linking up to Best of the Weekend – these will be featured tonight on my blog!